I made an unplanned visit to the Outlander costume exhibit. Mercy! My daughter and I were shopping in Santa Monica (after driving down from Northern California for her incoming freshman academic advising appointment at her new college), when a friend on Facebook (thank you Teresa!) reminded me about the free The Artistry of Outlander exhibit at The Paley Center for Media. Google told me it was only 30 minutes away and my daughter was game, so off we went. If you watch Outlander, you know that they spent the first part of the second season in Paris, where the costumes — for both men and women — are over the top. And this exhibit gives you an up close look at many of them. I did not realize how many fine details these costumes have that you simply cannot see on screen. Terry Dresbach, the Outlander costume designer, and her team cut no corners. This is my favorite costume from the Paris adventure. It’s one of at least two that draw inspiration from both the 18th century and the 1940s, which is noted on the display. Who knew brown and mustard and embroidered pink flowers could be so gorgeous together? Need a closer look? Claire’s Versailles garden dress — embroidery detail. Shudder. That’s enough of him. Let’s move onto something far more pleasant. Louise! Louise de Rohan’s blue silk dress. Louise de Rohan is just a cotton candy confection of a person. This dress is full of frilly details, but look at them closely. Louise de Rohan’s blue silk dress — trim detail. The striped trim has raw pinked edges that are currently raveling! I’m sure this could be tidied up with a pair of scissors, but it was rather amazing to see how the edges were finished. Details, that was the theme of the exhibit in my mind, even for the men. Comte St. Germain’s brown coat and pink vest. This is one of the more “plain” outfits Comte St. Germain wears. (He’s quite a bit more of a clothes horse than I realized. Many of his costumes are on display.) But look at the details! Comte St. Germain’s brown coat — trim and button detail. Comte St. Germain’s brown coat — cuff detail. Just look at the buttons and the trim! There are about two dozen of these custom embroidered buttons on this coat. Did you catch any of this when watching? Me either. Another exquisite dresser is Prince Charles Stuart, of course. Prince Charles Stuart’s brown embroidered jacket. This one has exceptional embroidery as well as custom embroidered buttons. Prince Charles Stuart’s embroidered brown coat — embroidery and button detail. 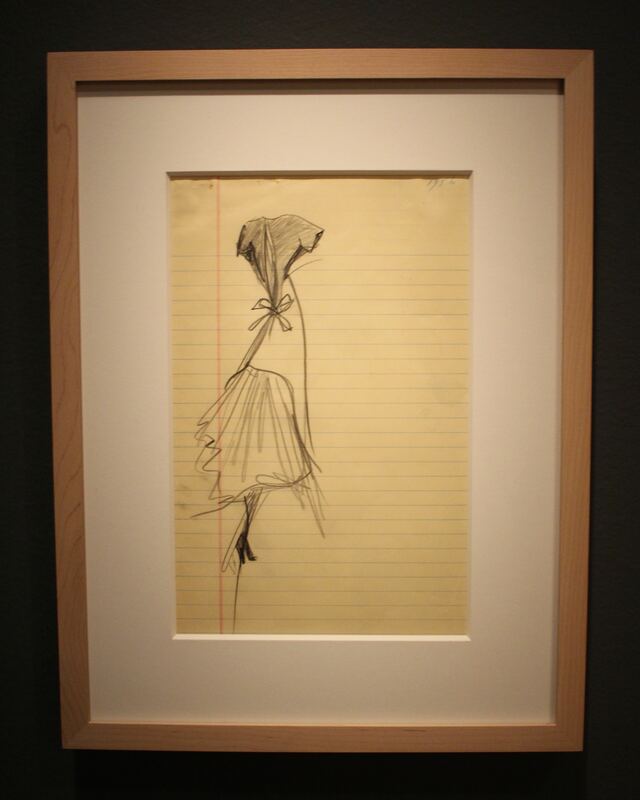 I hadn’t remembered the following dress at all, but it was one of my favorites at the exhibit, because it’s muslin! Louise de Rohan’s hand-painted muslin dress. Yes, it really is muslin. There are beautiful florals on pretty much every costume. Some of the florals are embroidered, but many are hand-painted, like on this dress. Louise de Rohan’s hand-painted muslin dress — sleeve detail. This dress also has raw pinked edges, hiding among the two different kinds of lace on the sleeve. Because of the humble muslin, this dress seemed more accessible than the rest. It seems almost reasonable that I could make a hand-painted muslin dress. Almost. Louise de Rohan’s hand-painted muslin dress — back detail. I had to look at this very closely to see how it closes. Clearly, the closure is at center back. But how? Hooks and eyes, that’s how! By getting as close as I dared (I’ve been told to step back at costume exhibits before), I could just see a hook through the widest part of the gap. No wonder no one could dress themselves! Can you imagine? 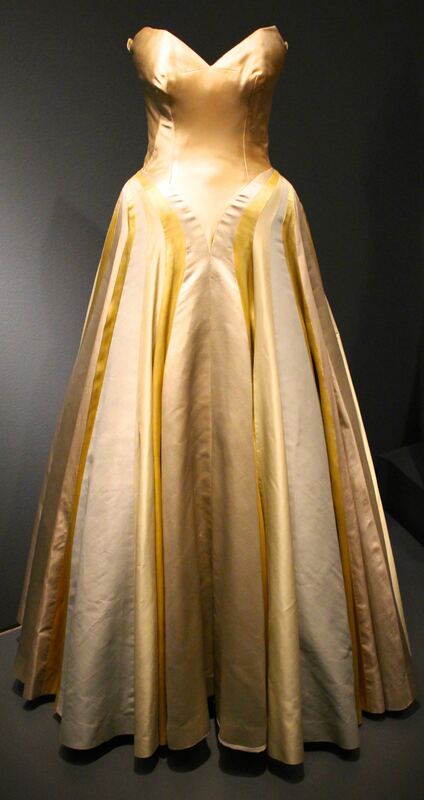 Although the original iconic “bar suit” dates from 1947 (which is just after Clare left that era), Terry Dresbach designed this suit to span the couture of Clare’s two timelines. I think it was a pretty clever idea. She’s the costume designer; she can do what she wants! 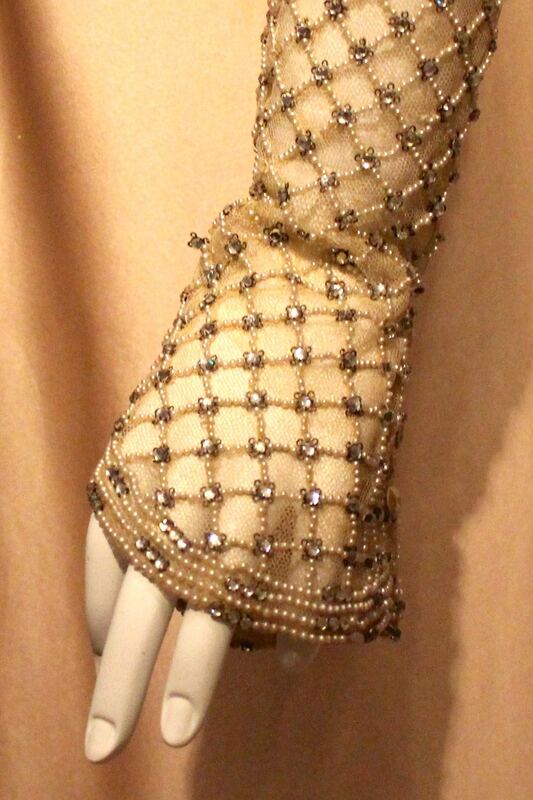 Clare’s Dior-inspired “suit” — matching gloves. And here’s another detail I didn’t see on screen, the cutouts on the matching leather gloves. I am becoming more and more fond of gloves, and although it doesn’t really get cold enough in my area of Northern California, I wear them in winter anyway. Now we’ve come to another of my favorites — Master Raymond’s jacket. Master Raymond’s jacket — detail. Master Raymond’s jacket — back detail. I just love this jacket. How much fun would it be to embroidery a vest in a similar fashion? I have an embroidery machine. It’s not impossible! And now we’ll wrap up with The Red Dress. The Red Dress was in the front window of The Paley Center, so there was no way to take a full-length shot without horrific glare (even on an overcast day), but, my camera has a tilt and twist view screen, so I could put the camera in front of the dress (where I wouldn’t fit), while I stood to the side to frame the shot. Et voila! Claire’s Red Dress — detail. The criss-cross straps in front, the neckline trim, the piping along the bodice bottom — There is so much more going on with this dress than I realized. Thank goodness I got to see this one, and so many others, in person. And my takeaway — I need to up my sewing game when it comes to the fine details. Painted muslin, mystical symbols, embroidered buttons — I want to try them all! As usual, I did not share everything at the exhibit — only the displays that inspired me the most. There’s much more to see! If you’d like to go, details are below. Wednesday through Sunday 12 to 5 p.m.
Another wonderful costume exhibit has arrived in San Francisco, so my Museum Girlfriends and I headed out to The City on a beautiful spring day. 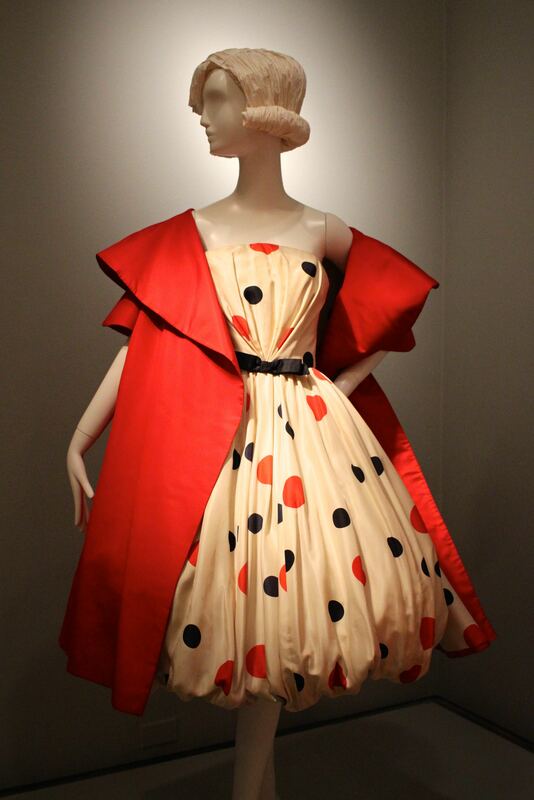 This month, High Style: The Brooklyn Museum Costume Collection opened at the Legion of Honor. The architecturally stunning museum is situated high on a hill in San Francisco’s Lincoln Park, with postcard-worthy views of the Pacific Ocean and Golden Gate Bridge. 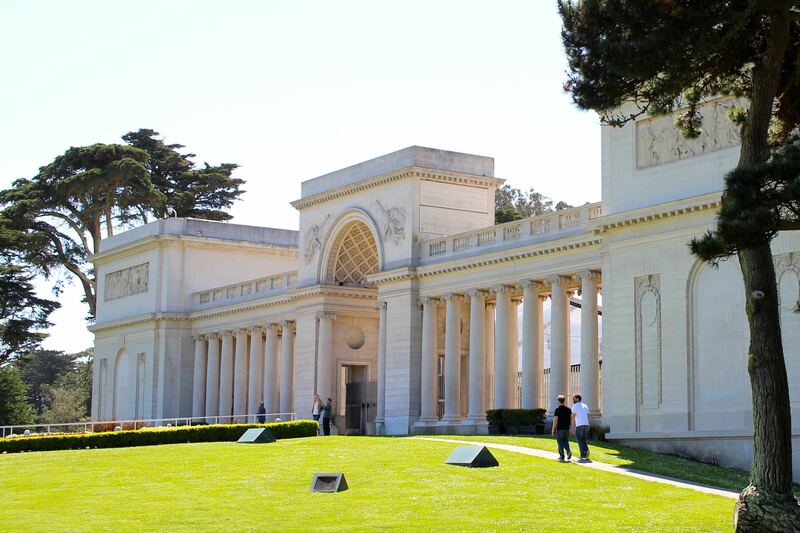 The Legion of Honor Museum. High Style showcases more than 60 costumes from the Brooklyn Museum Costume Collection at the Costume Institute of the Metropolitan Museum of Art. 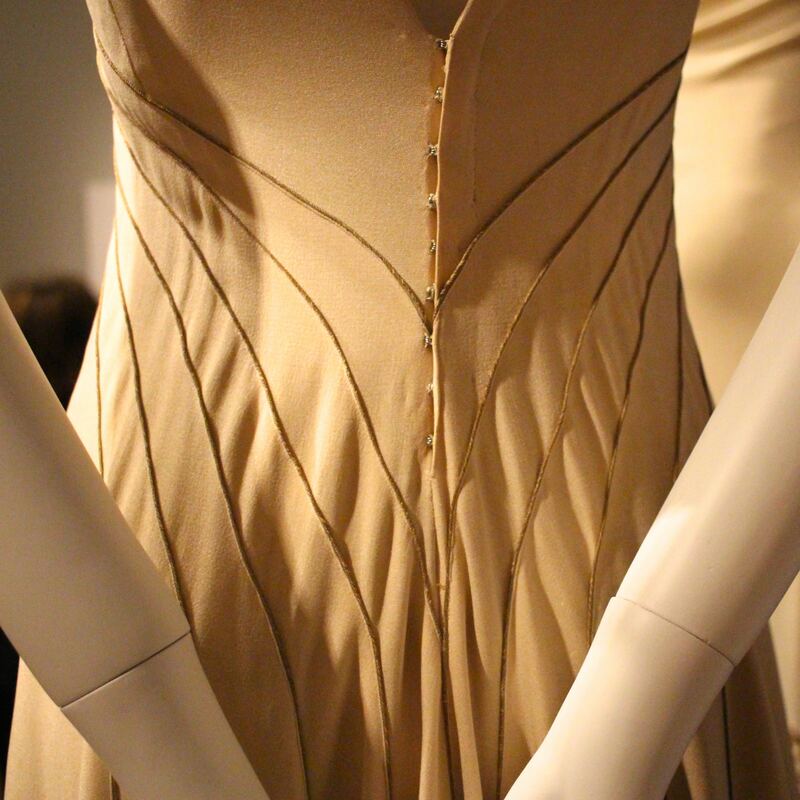 The exhibit captures key moments of 20th Century fashion design, from 1910 to 1980. 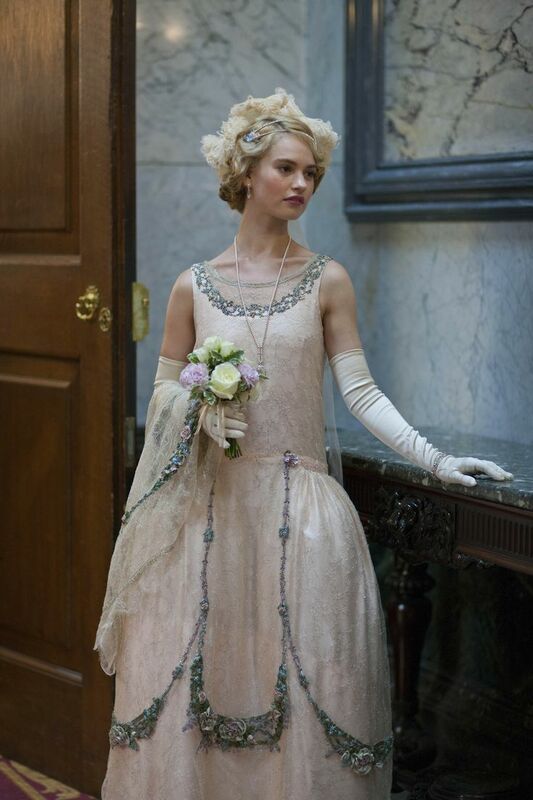 In this post, I highlight a few of the costumes that I found particularly interesting. 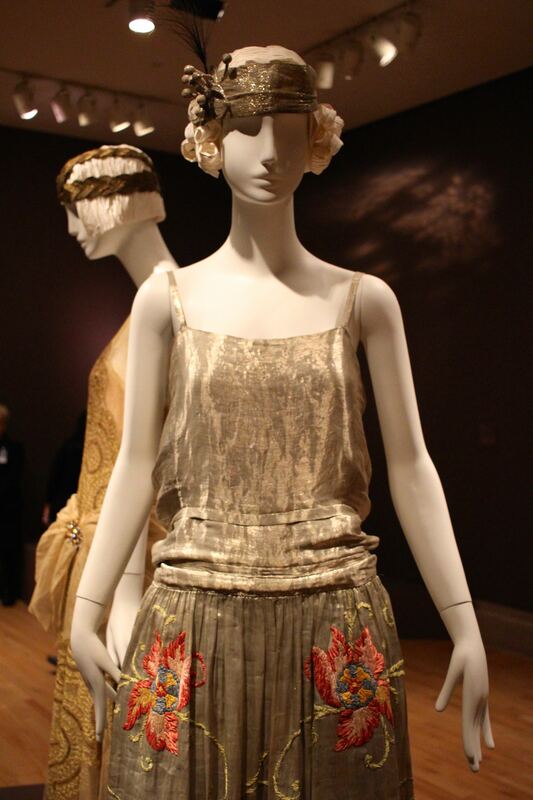 The first to draw me in for a closer look reflects the brief period in the early 1920s when wide hips accompanied the familiar dropped waists. This silhouette will be familiar to fans of Downton Abbey. Lady Rose sported similar styles in the recently concluded Season 5. Couture gowns feature hours of hand crafting, as the exquisite beading of this gown shows. 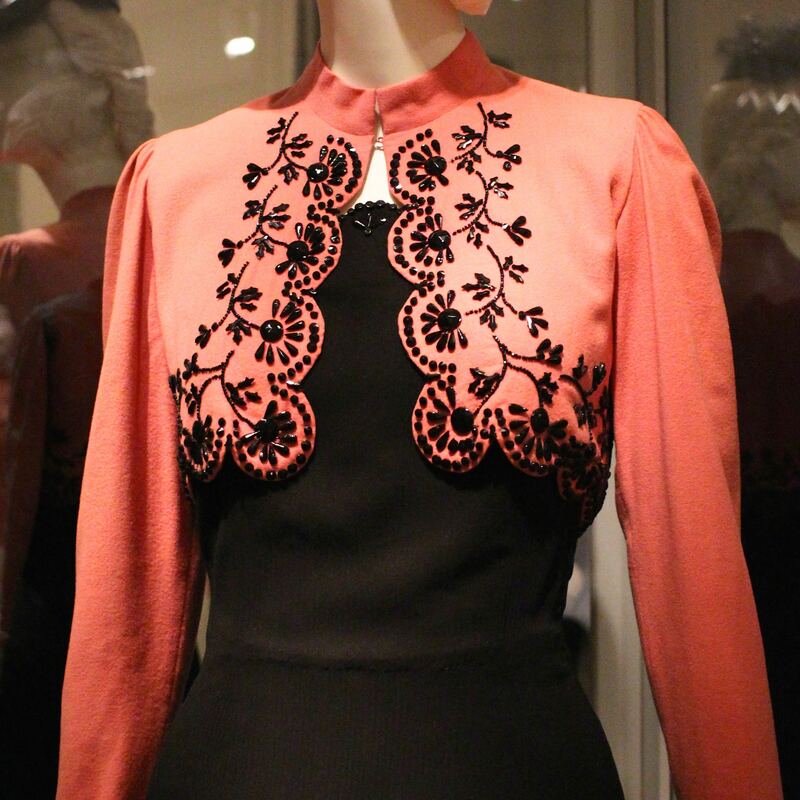 While some of the intricate beading on display seems out of reach for an amateur seamstress, the look of the bead detail on this bolero jacket could be emulated with machine embroidery. There was an unexpected vintage movie treat in the form of this costume. 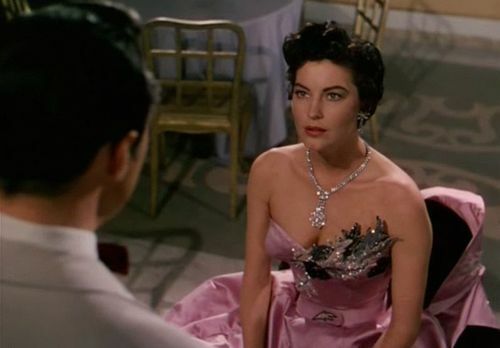 Ava Gardner in The Barefoot Contessa. 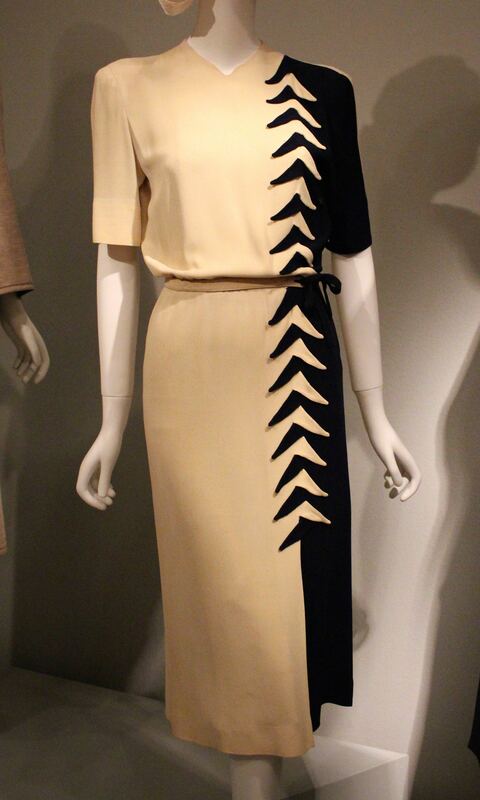 This American day dress from the 1940s was one of my favorites because of its graphic punch and timeless style. I don’t know how the crossover detail was achieved, but I’d love to figure it out. This dress features beautifully constructed seaming with gold trim inserted. 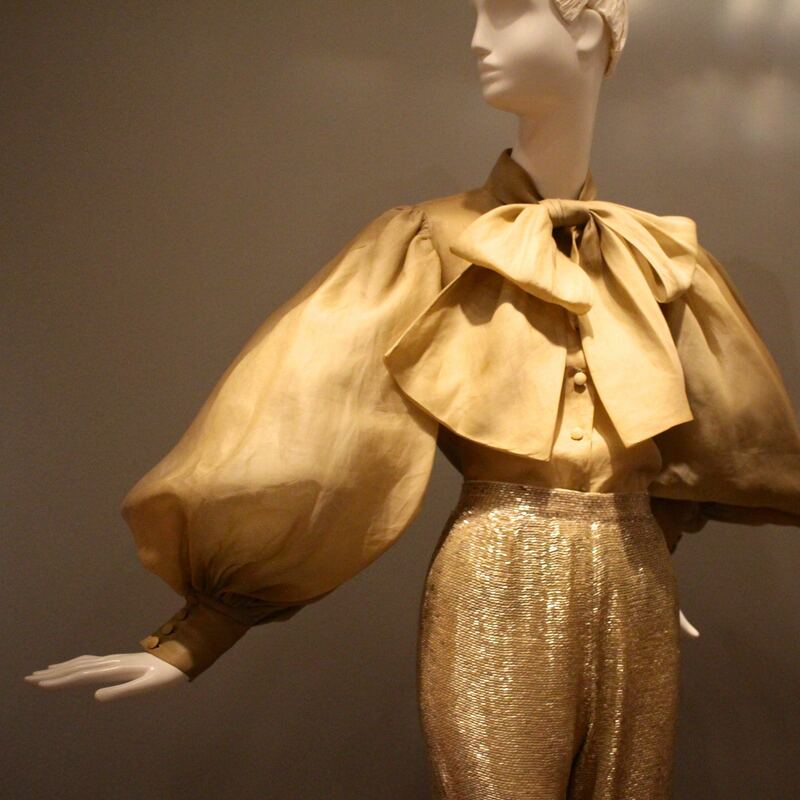 I have always loved this poetic and dramatic blouse style. It reminded me of a favorite movie costume. 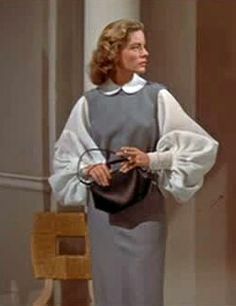 Lauren Bacall in 1953’s How to Marry a Millionaire. Below is my favorite garment in the collection. It’s fun and makes me smile. My companions and I decided this bubbly bubble dress would not work very well for a sit-down dinner. It’s strictly stand-up cocktail attire. 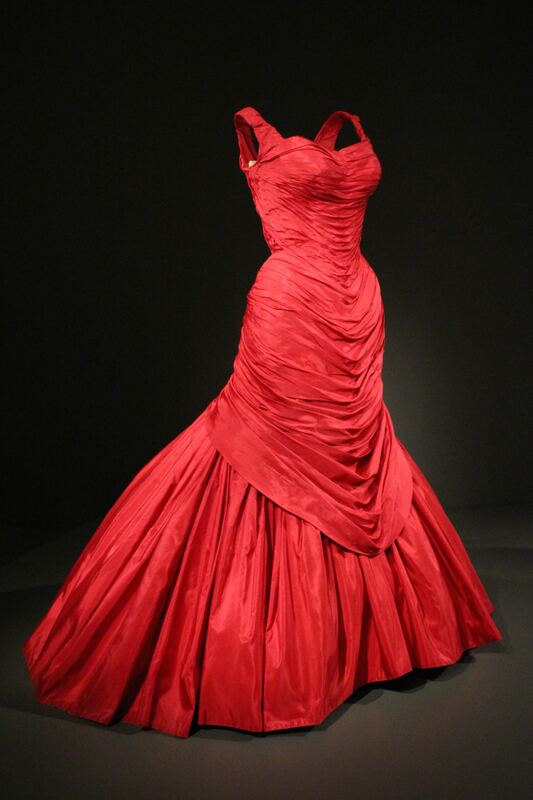 The last portion of the exhibit was devoted to Charles James, which I appreciated because although I was in New York during the last week of the James exhibit at the Metropolitan Museum of Art, I just didn’t have time to go. This James dress features three different kinds of fabric in similar colors so that it looks different as light hits it at various angles. I loved this charming sketch from James because it’s so relatable. It looks like it’s right off a legal pad! James was known for his elaborate garment understructures that turned clothing into architecture. 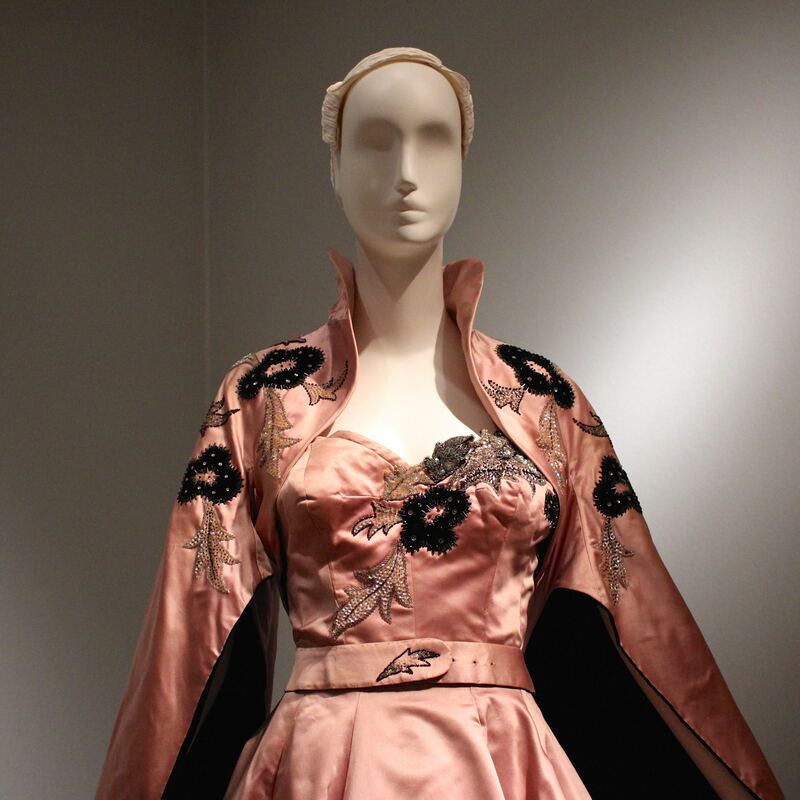 The showstopper garment below, along with the rest of the Charles James costumes in the exhibit, is not on a full mannequin like the other displays. This shows how much of the shape is within the garment itself, rather than from the form it is on. The room that houses the red dress also had monitors with fascinating computer animations showing flat pattern pieces turning into James’ three-dimensional designs, X-rays showing boning and other structure within dresses, and bisections of dresses to show how skirts are supported. As I said, this is just a small portion of the garments on display. I don’t even get into the striking hats and glorious shoes. If you’re a fan of 20th Century fashion and within reasonable distance of San Francisco, it’s worth the trip. The accompanying 250-page full-color exhibition catalogue, High Style: Masterworks From the Brooklyn Museum Costume Collection, features most of the garments from the exhibit and many, many more. It’s a great deal at only $35. High Style: The Brooklyn Museum Costume Collection will be on exhibit at San Francisco’s Legion of Honor Museum through July 19, 2015. Here’s a sneak peek of my tips in Threads magazine. I received my issue on Dec. 24 — Merry Christmas to me. As you can see, my tip is on Page 17. It’s issue No. 165, February/March 2013. I had previously posted that losing weight has put my sewing on hold. I’ve decided that even if I make clothes right now that are too big in two months, it will still be worth the effort. I’ll have learned a new pattern or a new technique or how to handle a different fabric. Every project is an opportunity to learn. When I get my weight to an optimum healthy place (28 pounds to go! ), I will have more sewing skills than before. So I am going to sew. I may focus on clothing that doesn’t neet precise fitting (a snappy new robe, anyone) or maybe some home improvement projects (window treatments to complement the blinds in the bathroom) or maybe a cape! But I have time, I have a modest fabric stash and I have the desire. So I am going to sew!